Tokyo Waterfront City, also known as Odaiba or Rainbow Town is one of the popular tourist destinations in Tokyo. The large artificial island was drastically developed in mid 1990s, when silver, futuristic buildings were built there one after another. Looks like R2-D2’s cousin(^_^) In the building, there are training room, gym, swimming pools, which is heated by utilizing waste of heat from the waste incineration plant next to the building. The Sewerage Exhibit Hall “RAINBOW” on the fifth floor is a promotion hall to teach visitors the sewerage system. Four pyramids are upside down! It holds 22 meeting rooms and a reception hall. The connected buildings are exhibition halls. It is an intelligent building with large satellites and antennas. The observation deck is opened for public and offering the great view of the Tokyo Bay and landmarks of Odaiba. 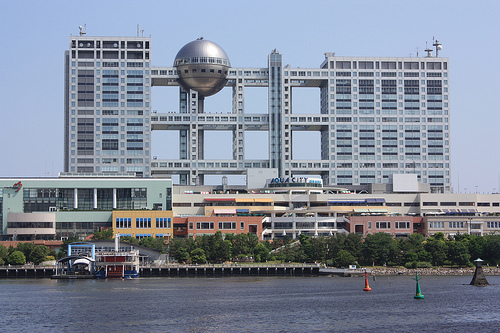 The most famous building in Odaiba. 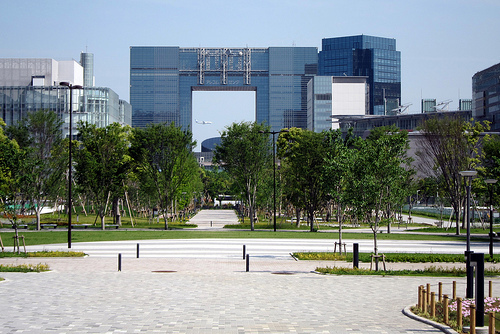 It is the head office of Fuji Television Network and has its main studios. The ball part is an observatory and opened for public. 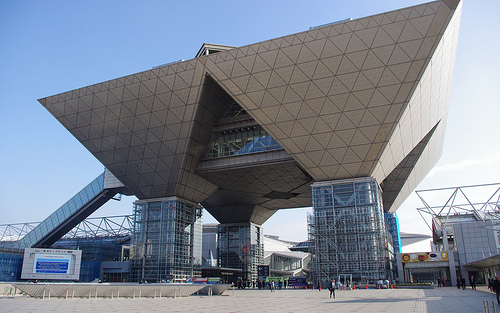 Tokyo Joypolis, Palette Town, National Museum of Emerging Science and Innovation are near the Fuji TV building.